Recycling is environmentally preferable to incineration and disposal and can save your company – and the state of Minnesota – money. We may think of waste as “garbage,” but waste materials have value. You might be able to sell your recyclable materials instead of paying to throw them away. In 2010, Minnesota recycling programs collected approximately 2.5 million tons of material worth $690 million (1). In 2010 in Minnesota, 1.2 million tons of recyclable material was thrown away that could have been recycled for an estimated value of $285 million dollars. Instead, it cost Minnesota over $200 million to throw it away into landfills (2). Recycling is tax-exempt in Minnesota, whereas solid waste is taxed by the state at 17% for commercial accounts, with some counties charging an additional tax (for example, Ramsey County has a 53% tax on top of the 17% state tax). Further, recycling has broader economic benefits, such as job creation. 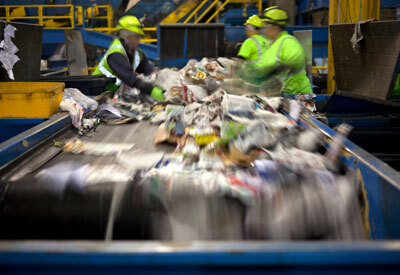 Research on the U.S. labor market suggests that recycling results in ten times the jobs of waste disposal (3). Diverting one additional ton of waste would pay $101 more in salaries and wages, produce $275 more in goods and services, and generate $135 more in sales than disposing of it in a landfill (4). In Minnesota, approximately 37,000 jobs are directly and indirectly supported by the industry. These jobs pay an estimated $1.96 billion in wages and add nearly $8.5 billion to Minnesota’s economy (5). Recyclables can be reprocessed into new products, which allows us to avoid the resource-intensive process of extracting raw materials. Processing recycled materials is typically more energy efficient than virgin material production. For example, producing recycled-content aluminum saves 95% of the energy required to make aluminum from virgin sources (6). There are a number of recycling best practices that should be employed in any recycling program. We’ve grouped these into three areas: infrastructure (containers and signs), education, and evaluation, discussed in more detail below. Learn more on our Waste Assessments, Sorts, and Tools page. Placement – think about where people dispose of waste. For example, it might not make sense to put your containers next to vending machines if people aren’t eating and drinking in that same area. Container style – strive for containers that look the same throughout your facility. Pick one color for trash cans and one color for recycling bins and stick to it. This makes it easy for people to use the right containers. Collection containers – ensure that your collection dumpsters or containers are easily accessed and labeled so that maintenance or custodial staff can dispose of materials from within your facility in the appropriate places. Good infrastructure is a start, but education is just as important. Ensure that all employees understand your commitment to recycling and know how to use your recycling system – it may differ from what they have at home. Education is especially important when introducing new materials into your recycling program. Go beyond signage and include recycling education in staff meetings and trainings. And don’t forget about new employees – integrate recycling information into new employee orientation. Recycling advocates or green teams can also deliver reminders, answer questions, and lead by example. Giving feedback can help you diagnose possible problems and motivate your employees to do even better. Periodically look in your bins to make sure that materials are ending up in the right containers, and then give feedback to employees. Friendly competitions between units or areas can help motivate people to do more. Verbal reports or graphs showing recycling rates over time can also be motivational tools.